With the holiday season officially upon us, I have moved into heavy baking mode. This time of year, I especially love to bake cookies and other treats for giving to family and friends. I have stacks of recipes, old and new, to try out. 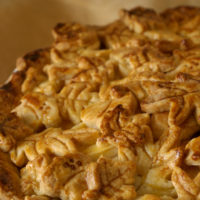 I would love to share these recipes with you and hopefully give you some ideas for your own home-baked gifts. So, I am giving you my own little holiday baking guide, beginning with these cookies that remind me of my mother. 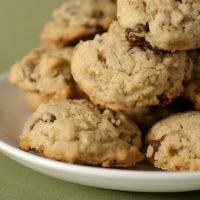 As a child, especially around the holidays, I frequently asked my mother to make one of my favorite cookies. She called them Sand Tarts. I loved helping her make them, especially shaping them and rolling them in confectioners’ sugar. After I began my own baking adventures, I came to realize that these cookies have many different names. 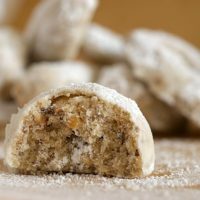 Most frequently, I have seen them referred to as Mexican Wedding Cookies, Italian Wedding Cookies or Russian Tea Cakes. I’m not sure why those are all given a nationality in their names, but I suppose it just proves their worldwide appeal. I don’t know what happened to my mother’s recipe for those cookies. I have looked through many of her collected recipes but I haven’t found it yet. I’ve been putting off making similar recipes because I really wanted to make the one I remember. Finally, I decided not to wait any longer and turned to a comparable recipe I found in Cook’s Illustrated‘s Holiday Baking issue. This recipe suggests trying different nuts, like almonds, pecans, hazelnuts. As most good Southern women would, my mother made hers with pecans. In my mind, they wouldn’t taste quite like hers anyway, so that’s why I went with hazelnuts. Well, that, and the fact that I’ve come to love hazelnuts this year. As for the final result, they’re not exactly like Mama used to make, but they are very good. Flavor-wise, these are such simple cookies. To me, there’s just something about the simple combination of butter, flour, and nuts that is so appealing. The only downside is that with such subtle flavors, it’s far too easy to eat far too many. Mix 1 cup nuts, flour, and salt. Set aside. Place remaining cup of nuts in a food processor and process about 10 to 15 seconds until the nuts resemble coarse cornmeal. Stir into flour mixture. Using an electric mixer, beat butter and sugar until light and creamy. Beat in vanilla. Add flour mixture and beat until dough is cohesive, scraping down sides of bowl as needed. Take one tablespoon of dough at a time and roll into a ball. Cookies can be baked as balls or can be rolled between palms and shaped into crescents, rings, or small bars. 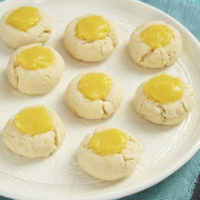 Place cookies on baking sheet. Bake about 15 minutes, or until tops of cookies are pale golden and bottoms are just begining to brown. Cool on baking sheets about 2 mintues. Transfer to a wire rack to finish cooling to room temperature. 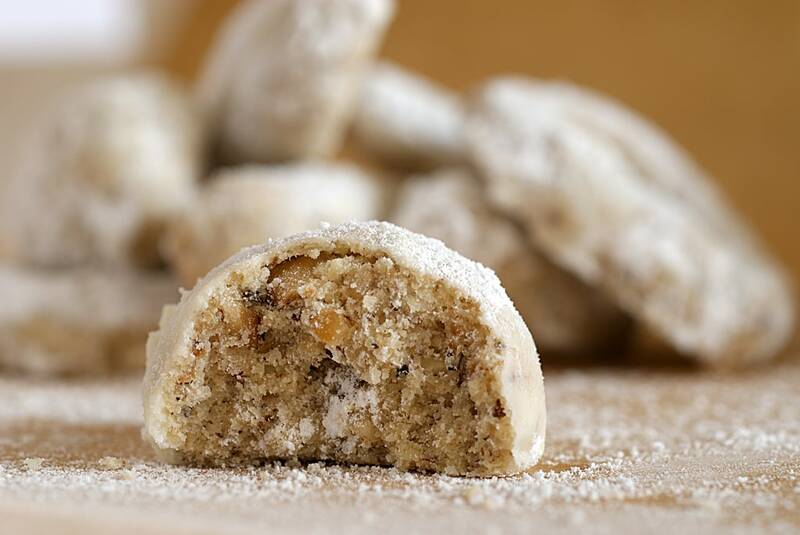 When cookies have cooled, roll each in confectioners’ sugar to coat completely. Shake off excess. sugar. 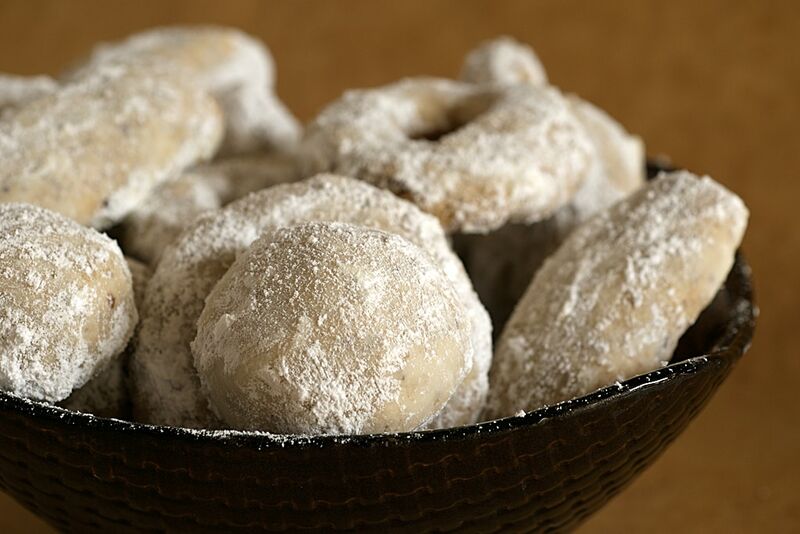 Cookies can be rolled again in confectioners’ sugar before serving. *Feel free to substitute pecans, walnuts, almonds, etc. **Don’t have superfine sugar? Process regular granulated sugar in a food processor about 30 seconds. Recipe adapted from Cook’s Illustrated. What a coincidence that I stumbled upon this. I’ve been living abroad for the past few months and have been feeling nostalgic for holiday baking (and, more specifically, for cookies like these). My mom and I usually make these every year using her old family recipe. We call them “sand tarts” as well and always make them with pecans. With a splash of extra vanilla thrown in, they are the best! EAB, what a wonderful coincidence! I don’t know if it’s just the cookie or the memories, but these are definitely the best. Just lovely! 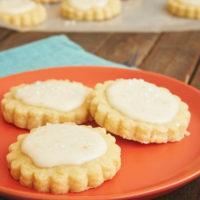 I know these as mexican wedding cookies. It doesn’t matter what there name is; as long as they taste great and bring back all of our wonderful Christmas memories. I’m going to make those cinnamon roll cookies—thanks for listing the recipe! These are one of my absolute Christmas favourites! Beautiful! JEP, you’re welcome! I hope you enjoy them. I love these too, and I’m trying to decide which recipe to go with. Are yours crisp or soft inside? I really like the soft, nearly underbaked variety. Julie, these cookies are wonderfully soft inside. I like all cookies a bit underbaked anyway. I’m not a big fan of crispy cookies. If you make them, let me know what you think! Thanks so much, Jennifer. 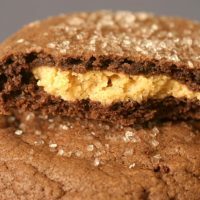 The first thing I want to know about a new cookie recipe is, are they soft or crispy! Oh, I loved these!! I hope you saved some for me! This was a specialty in our childhood, huh? Should I assume that the 1 cup of nuts that was processed to meal consistency is added to the dough? I reread the instructions 3 times. 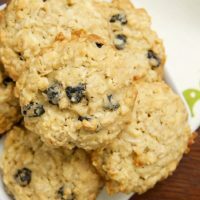 This sounds just wonderful and know my husband will adore these cookies. Thanks so much for posting it. Hi, Karen. Yes, mix that in with the flour mixture. I’ve clarified that in the recipe. Thanks! hi there, sorry if this is already written somewhere but i can’t seem to find it. approximately how many cookies will one batch make? Hi, Tina. If you use a tablespoonful of dough per cookie, you’ll get about 4 dozen cookies. Do you hazelnuts with skin or without skin? Hi, Lejing. My preference would be to remove the skins.